New world wind industry statistics show an annual installed capacity record for 2012, the U.S. moving up to first in the marketplace, and GE Wind overtaking perennial leader Vestas as world leader among turbine manufacturers. 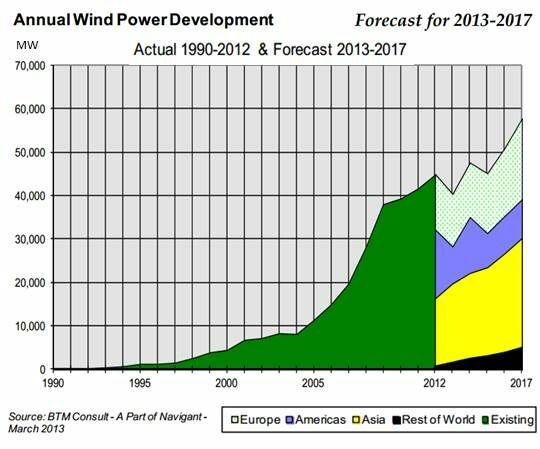 The report The International Wind Energy Development: World Market Update 2012 shows significant shifts and trends in the world wind industry, according to co-author Aris Karcanias. It also shows a slowdown coming. 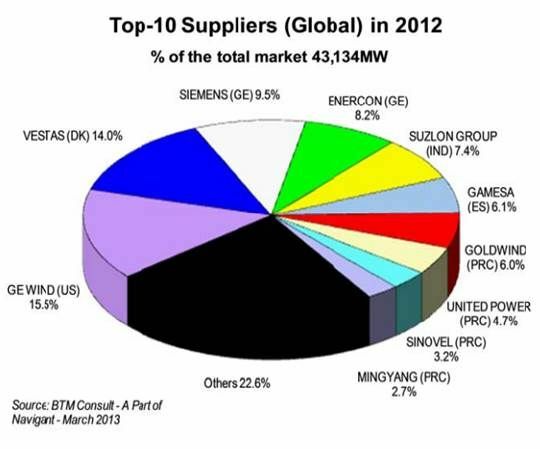 China remains the main international turbine making "hub," Karcanias noted. But thanks to the rapid rise of Siemens (NYSE:SI), which now holds 9.5 percent of the original equipment manufacturers (OEMs) market, and the continued success of Enercon, Germany and Denmark taken together can also be seen as an important world turbine manufacturing center in 2012 depite the fact that Denmark’s Vestas (14 percent) fell behind GE (15.5 percent). GE succeeded because the U.S. market boomed while the Chinese market was slowed by transmission and curtailment issues (as reported in the GTM Research/Azure China Wind Market Quarterly Q4 2012 report). GE’s 1.6-megawatt machine was the most installed wind turbine in the world. Wind provided 2.62 percent of the world’s electricity in 2012, according to the report, with a record-setting gain of almost 45 gigawatts of capacity, which increased total installed capacity to just under 286 gigawatts. 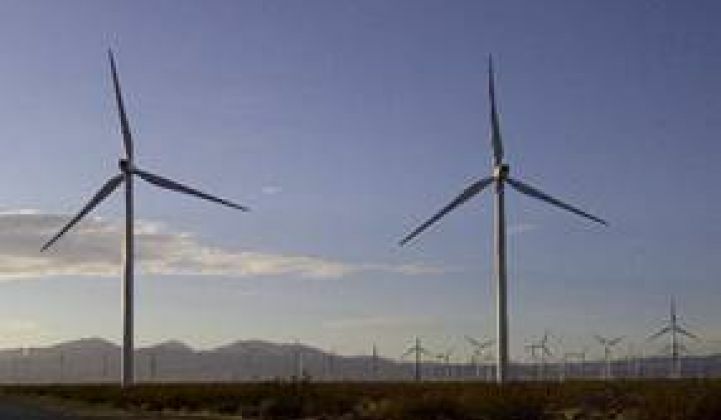 The U.S. was the world’s biggest wind market, building 13,124 megawatts. China was second with 12,960 megawatts, while Germany, India and the U.K. followed in the top five. The average size of onshore and offshore turbines continued to climb upward. Direct-drive systems increased to 19.5 percent of the market. The EU financial crisis, which will continue to hamper Europe's wind growth. World wind production will almost double to 4.9 percent of the world’s electricity in 2017 and see an increase in its economic value from 2012’s $73.85 billion to $109.16 billion. 2014 will see a recovery with a 47-gigawatt installed capacity jump, followed by another drop-off in 2015, and then slow but steady increases through 2017. Drivers of growth include strong markets in China, India, the Asia Pacific (especially Australia) and Latin America (especially Brazil and Mexico). The forecast, Karcanias explained, assumes no U.S. PTC after the current extension. With a reasonable phase-out over several years, he said, the U.S. could have significantly more than the predicted 3.5 gigawatts to 4 gigawatts per year growth driven by state mandates and wind's increasingly competitive price. Although U.S. offshore wind is not expected to be more than 700 megawatts by 2017, as much as 18 percent of the world’s “total global demand” could be on the ocean, Karcanias said. It will be led by the U.K.’s 7.5 gigawatts, Germany’s seven gigawatts, and China’s six gigawatts (from a present installed base of only 320 megawatts), as well as significant growth in South Korea and Japan. Forecasts are based on recorded wind production at the end of 2012 and an assumed national average capacity factor, Karcanias said. The U.S. average capacity factor comes out as the best in the world at 31 percent. China’s comes out in the low 20s.